Management aims for a particular heathland need to be clearly defined and should be accompanied by a detailed management plan. The twin requirements of controlling tree growth and producing Heather of diverse age are usually satisfied by a system of rotational management. This is done by dividing the overall area up into plots. The plots are then either cut, grazed or burnt on a rotational basis. This both checks tree growth and produces Heather of a variety of ages on the site. The ability of Heather to regenerate declines with age and this needs to be taken into account when planning the rotation. Areas of very old Heather, which tend to be more open and bare, may be important for the conservation of reptiles. Such areas, which need to be managed separately for the conservation of a particular species, may need to be excluded from the rotation. Rotational management works well on large heathland areas. Small areas can be very difficult to manage because they are not big enough to divide into separate plots. 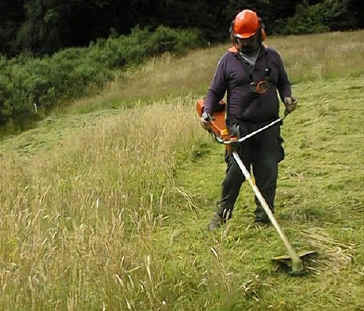 Heather cutting has been practised since Roman times. It has been cut and baled commercially in the New Forest in Hampshire right up to the modern day. The timing of cutting needs to be sensitive to animals on the heath and it should be avoided during summer breeding seasons. Large areas can be cut using a mower, tractor-mounted swipe, or forage harvester. Smaller areas may be cut with a brushcutter. The cuttings should always be removed to prevent enrichment of the soil through decay. 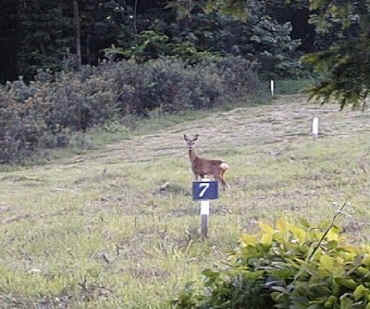 left: Roe deer can sometimes be seen grazing on the Heathland Restoration site. Grazing needs to be carefully controlled. Stocking rates are important to prevent both over and under-grazing, which are both detrimental to heathland communities. The type of animals used is also important, as different animals have different grazing preferences and different effects on the habitat. For example, horses are more willing to graze woody material than cattle, but strip the vegetation closer to the ground and need to feed for longer periods to obtain the same food value. Sheep have been successfully used to manage heathland areas. Wild animals such as rabbits may also have a considerable impact on heath communities and may in some cases need to be controlled. The aim of burning is to remove all above-ground vegetation cleanly, yet leave the roots unharmed for regeneration. It is only relevant on large heathland areas and may be impossible if the area is surrounded by forestry plantations or housing. It needs to be very carefully controlled. Accidental fires can be absolutely devastating because they are totally uncontrolled and usually occur in the summer breeding season. Burning, whether accidental or controlled, will obviously lead to the local extinction of some animal species. 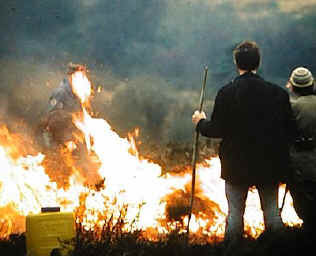 Areas to be burnt should be surrounded by fire-breaks for containment of the fire, as well as by older Heather, to allow subsequent recolonization of the area. Firebreaks can provide important habitats for animals such as Common Lizards and adders which bask in the open areas which are created.